I'm not gonna lie, packing lunches is the worst part of the school year for me. I can deal with the homework and the busy schedules, but for some reason I just dread packing lunches for my kids. It's just such a chore to make sure they are healthy and balanced and that they are something my kids will actually want to eat. 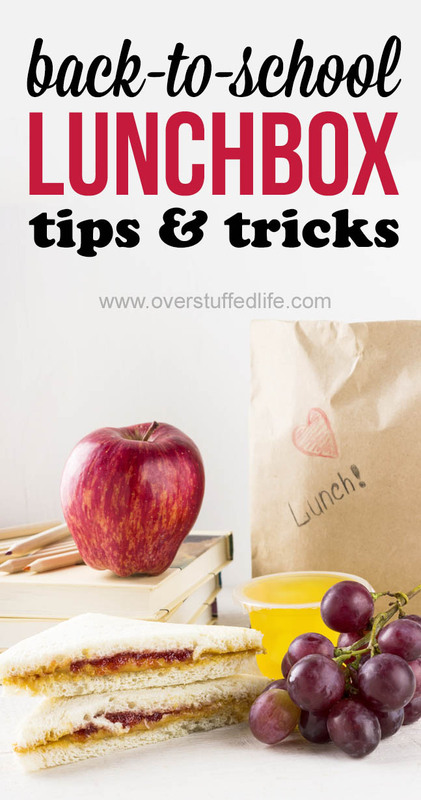 Over the last 13 years—yes, my eldest is going to be a senior this year and no, I definitely don't want to talk about it—I have learned a few great tips and tricks for making the whole lunch packing thing easy. In fact, I've learned how to make it so easy that my youngest has been mostly packing her own lunches since first grade. Following are the products that I use and all the tips I've got up my sleeve after doing this for so many years. I hope they help make packing school lunch easy for you, too! For younger kids especially, this makes a huge difference. Buy them a lunchbox that they love, and then use containers and other accessories that will make it easy to pack their lunch and fun to eat. Neoprene Lunchboxes—While we have used many different types of lunchboxes, I have found that we like the neoprene style best for cleaning. This one and this one are both cute for girls, and I think boys would probably like one like this or this Batman one. Nike Lunchboxes—Yes, I know I just said I like the neoprene ones best, but my teenagers think they are a little embarrassing. So, once they were out of elementary school, they started choosing more non-descript lunchboxes, and once Chloe found the Nike lunchbox, she fell in love. Bubba Water Bottle—This has been our favorite water bottle the past couple years. Small Thermos containers—These are perfect for soup or other warm foods. My kids do have access to a microwave at school, but it's nice to not have to worry about it and know that they have warm food in their lunchboxes. I really like these Foogoo style thermoses and these inexpensive ones also work remarkably well. Mini containers—I like using these smaller containers for things like nuts, canned fruit (rather than buying the fruit cups), olives, trail mix, dried fruit, and so forth. I've collected a million different types of small containers over the years, but I really like these ones because they are nestable and much easier to store. Sandwich cutters—My kids have largely grown out of these, but they loved them when they were younger. It's so much fun to open up your sandwich and find out you have dinosaurs or hearts or some other fun shape instead of a boring old sandwich! Sandwich containers—And speaking of sandwiches, while there is a nice space for a sandwich in the compartmented containers I listed above, it is also nice to have separate sandwich containers. I'm not a fan of using plastic baggies for everything, so I like having it all in these types of containers. I like these colorful ones, or you could get really fancy with this kind. All of these things are used regularly at my house. I have purchased other little fun things like these bento boiled egg molds, but mostly we stick to fun (and practical) containers and that does the trick. We keep lunchboxes, water bottles, and all lunch containers and lids in one cabinet. While I admit that it gets pretty messy in there sometimes, I try to keep it as organized as possible. I've got bins for the lids and the small containers and everything is relatively easy for the kids to find while they are packing their lunches. While we do buy some easy prepackaged stuff for lunches, I do try to make healthy options for the kids and freeze it ahead of time so it will last through the week (or longer, if I'm lucky!). I freeze these things because if I don't, they will get eaten very quickly! I set out enough to defrost the night before, so the kids can put them in their lunches. If you are sandwich people, then you can also make those ahead of time and freeze them. I also have a build a healthy lunch printable hanging in my pantry that shows the kids what they should be packing in order to keep their lunches healthy and balanced. We've been using it for a couple years now, and I love that they are learning to do this on their own. You can download this printable at the bottom of this post, along with several other back-to-school printables. Some of my favorite bloggers and I have teamed up to help you be more organized in all areas this school year! We are offering a back-to-school printable bundle that includes my Build a Healthy Lunch printable and 40 other pages of back-to-school printables. 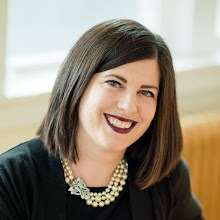 Back-to-School video interviews—Katelyn from What's Up Fagans? has put together a great package to help you capture your children's personalities each year as school starts. 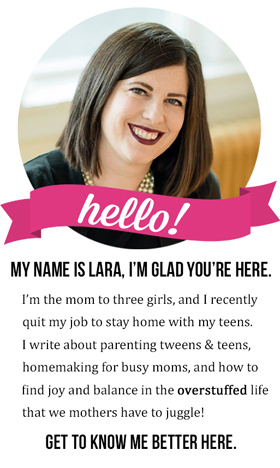 She has tips to make the videos turn out great as well as lists of questions to ask for kids of all ages. 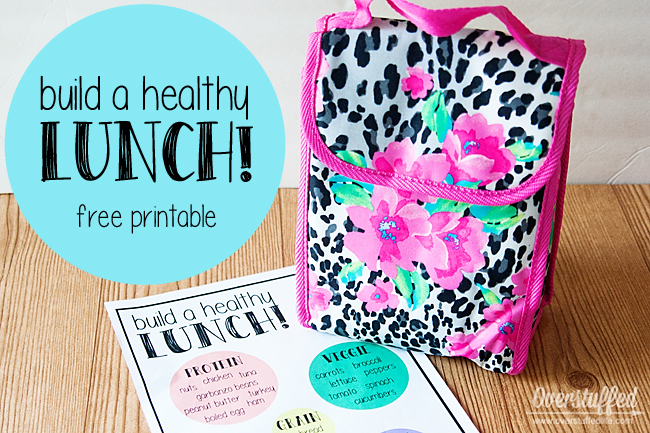 Build a Healthy Lunch—My printable is meant to hang in your pantry to help kids know what to include in their lunches. 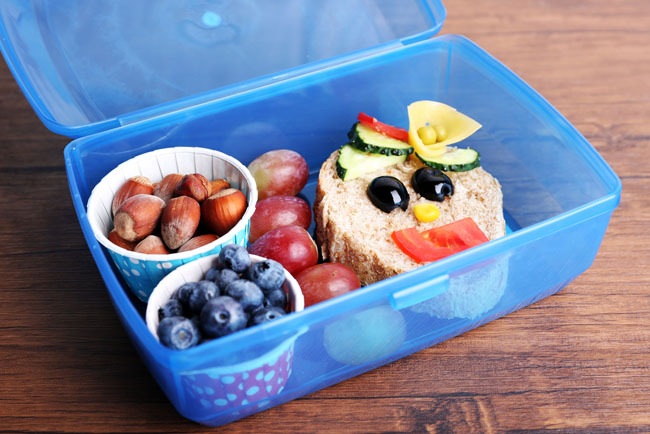 This way they can learn to pack a healthy and balanced lunch while they are still young. My girls use this printable on a daily basis during the school year and it has saved me a lot of time. 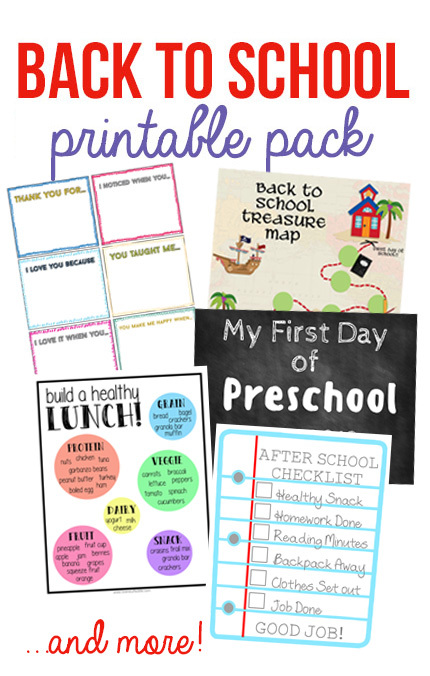 First Day of School Signs—Katie from Clarks Condensed has made adorable chalkboard printables for the first (and last) day of school for preschool all the way up to 12th grade! Your kids can hold them up in their photos as they go to school on the first day. Daily School Schedules/Emergency Contact Forms—When you start to have kids in more than one school, keeping their schedules straight becomes really complicated. 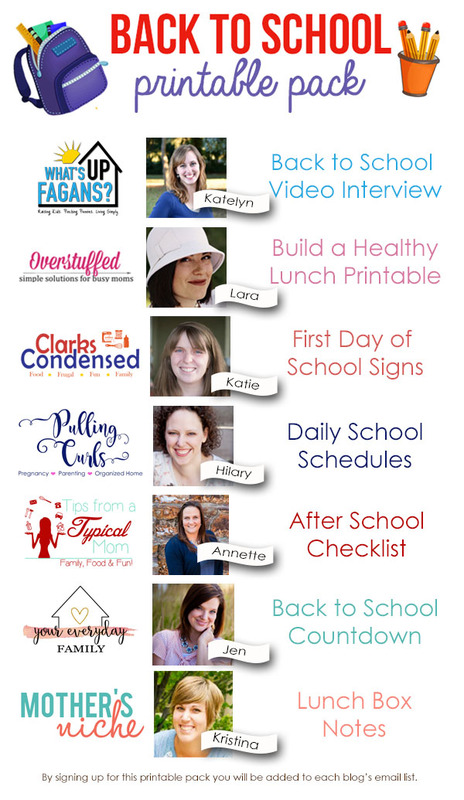 Hilary from Pulling Curls makes this a lot easier with her school schedule printable. She also includes a printable for emergency contact information so you don't have to look it up every time you need to fill out forms during the first weeks of school. After School Checklist—Annette at Tips from a Typical Mom has made a cute checklist for the kids to refer to after school. You can frame it so they can use a dry-erase marker to check off their progress. 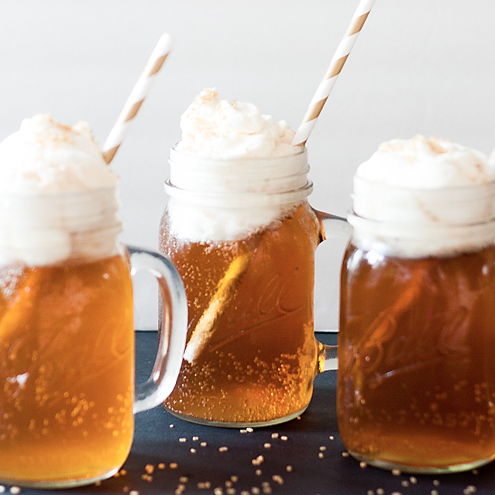 Back-to-School Countdown—Jen from Your Everyday Family has created the most adorable way to countdown to the first day of school! If your kids love pirates and treasure maps, they will especially love this idea! Lunchbox Notes—My girls love it when I include fun little notes in their lunchboxes! Sophia has even gone so far as to bring me a pen and paper and tell me to write something for her lunchbox after she's packed her own lunch! Kristina at Mother's Niche has made this easy to do with a cute printable to start your notes off right. Simply enter your email address into the form below and the printables will be sent directly to you via email!